Sorry that I've gone a week already without posting, and sorry that this is another Star Wars post without anything in between; I'll try and get back into the regular routine after this. 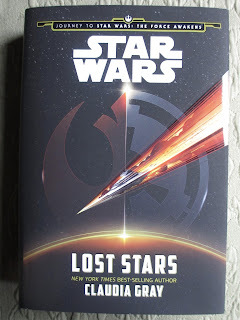 Even though Claudia Gray's Lost Stars was marketed less heavily than Aftermath was, the former did what I wanted the latter to do--and was disappointed that it didn't do. And that's the single direct comparison I'll make between the two. This book made sense as being part of the Journey to the Force Awakens, though that might seem odd because it in fact covers much of the same space as the original trilogy. Once again, I knew little about this book coming in, just that it was a young reader book and was supposed to be a Romeo and Juliet type story. I don't know what young reader means, if that's middle grade or more teen. The prologue feels middle grade, then the first maybe hundred pages are fairly teen/YA. After that, I'd throw out the young reader label completely; I don't get it. What is interesting is the way that the book shifts along with the age of the characters; this not only allows you as the reader to see age development but also the development of ideas and perspectives. What this book offers is a look at people, just people who are living in the events we're all so familiar with. It isn't a story about what makes a character into a villain because the characters of primary concern aren't villains. It's a story about what motivates these characters, what makes them choose the choices that they choose, and why they believe in what they do--and how all of that does or does not change over time. Because it covers ground all the way from eight years after the beginning of the Empire to about a year after it's fall, there is a lot that this book goes over and there are a lot of skips over periods of time, whether months or years. But the pacing all felt right and so did the focus: we're already familiar with the Battle of Yavin, with Hoth, and with the second Death Star, so we don't need to have too much focus on basic details. It's enough just to know what these new characters think of events and where they were during these events. Never did this book feel like we were just getting a repeat of Episodes IV-VI; the difference in perspective means that what is important at different moments is entirely different. What matters to Ciena and to Thane isn't always the same as what mattered to Leia or Luke or Darth Vader or anyone else we've previously been familiar with. Ciena and Thane begin as bright children with dreams, then they develop into young adults trying to make those dreams a reality, and then they become people who are more aware of themselves and of other people. Duty, honor, community, justice, humanity, friendship, loyalty, and of course love are all concepts that they try and define and then act on. And in a time of war, well, it's all a mess. The only thing I found missing was just one more image of what happens toward the end (I mean, the end before that final, sneak peek-type scene). It almost ended like a book in a series--but as far as I know this is a stand-alone book. It could be possible, though, that pieces of this story (other than that final scene) will make it into other books or movies in some form. I hope so because I just want a little bit more closure. Other than that, this was a good read and I'm surprised that it wasn't marketed that highly (at least not that I saw). Even though it's a break from all the vital events (Anakin turning dark and then Darth Vader leaving behind the dark), the themes are just as important, if not so elevated: they're the themes of two people trying to find their way in the world--despite the world. 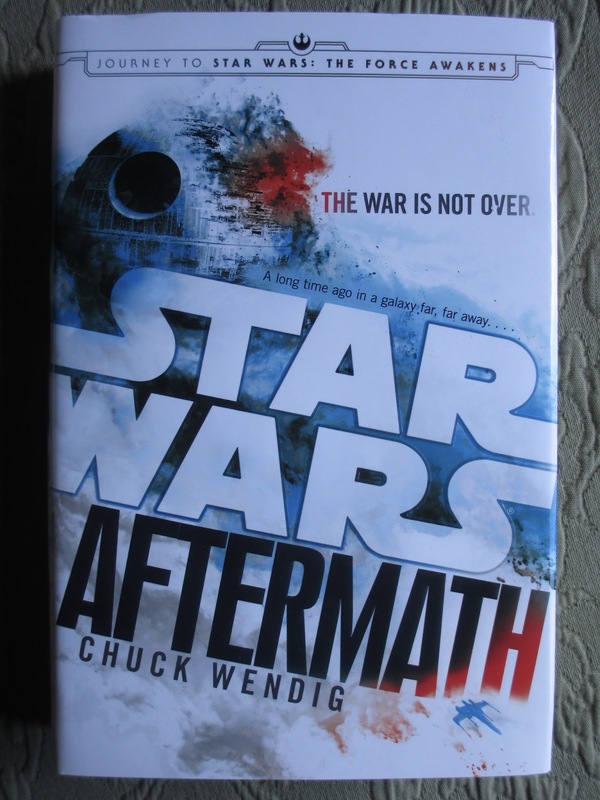 I had absolutely no idea what to expect from Chuck Wendig's Aftermath. Remember, I don't read book summaries/back covers/book jackets of books that I'm already planning to read. So I had no idea who the characters were going to be, what the plot would be, or even what the timeline would be. And you know what? I feel like I still don't know much about Aftermath even after reading it. When I was, oh, around halfway through or so, I called the book "scatter-brained." If you've read it, you know what I mean. While the basic plot follows a small handful of characters, jumping back and forth between perspectives and sides, there are also "Interludes" between chapters that take you to separate planets, characters, and scenes. These Interludes are basically showing what is going on in the rest of the galaxy in very brief glimpses that barely give you time to remember a completely new set of characters, only to have that new set of characters disappear again after two pages. They're the type of glimpses that would maybe work better in a movie than a book: it would be easier to see these quick scenes play out than to have to follow them while reading. What's even odder is that, for all these little scenes added in to give relevancy to the main story, this book felt rather irrelevant. Yes, most of the focus is on characters we've never met before, but I don't think that's the problem: a book gives enough time to develop new characters and get the readers to care about them. I think by the end of the book, I did care . . . enough about these characters. But the story just felt like it was hanging in space, detached from everything rather than conveying everything. I complain also because this book was so highly marketed, more than the other Star Wars books I've read so far. It's part of the "Journey to the Force Awakens." It's supposed to show what happened after the destruction of the Death Star and lead us in to Episode VII. Maybe it did that--but it's hard to tell what it did right now. Like I said, it's like this book is floating right now without anchor; after all, it is the first book of a trilogy and perhaps after we've seen Episode VII and the rest of this book trilogy comes out, we'll have more context. Right now, it's like this book was just 370 pages devoted to saying that the destruction of the Death Star didn't mean the immediate death of the Empire and that there was still work to do in a divided galaxy, with people on both and any and all sides of the matter for any and all reasons. And from what we've seen of Episode VII, it looks like that's an important fact to remember going into the new movie. But if that was all these 370 pages were here for, well, I feel like something was missing. The book wasn't terrible (I didn't hate it like some people seem to), but it just didn't deliver all that I wanted or was expecting it to. 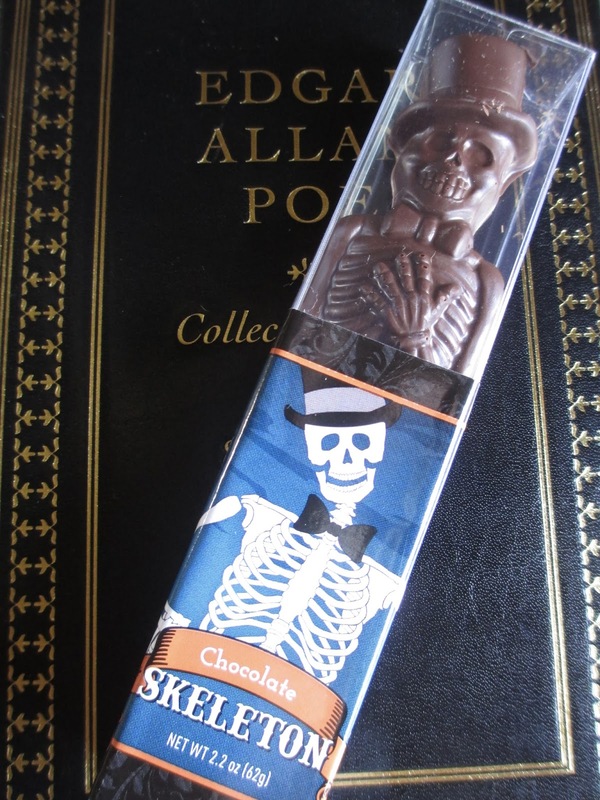 Quite the dapper-looking gent is this Chocolate Skeleton from the shelves of World Market and made by Salvatore Constantino Chocolates out of Fresno, California. Just in time for Halloween, I would say this is my style of Halloween, too: it's a skeleton, but he looks friendly and fancy, not scary or grotesque. The chocolate is molded decently but could be a little neater considering that the shape of this chocolate is what makes it itself. Some of the edges are a little sloppy, there are just a couple more air bubbles than I like to see, and the finish doesn't look quite right in certain spots. You know, given that the shape/mold is what matters most. Because it isn't the chocolate. 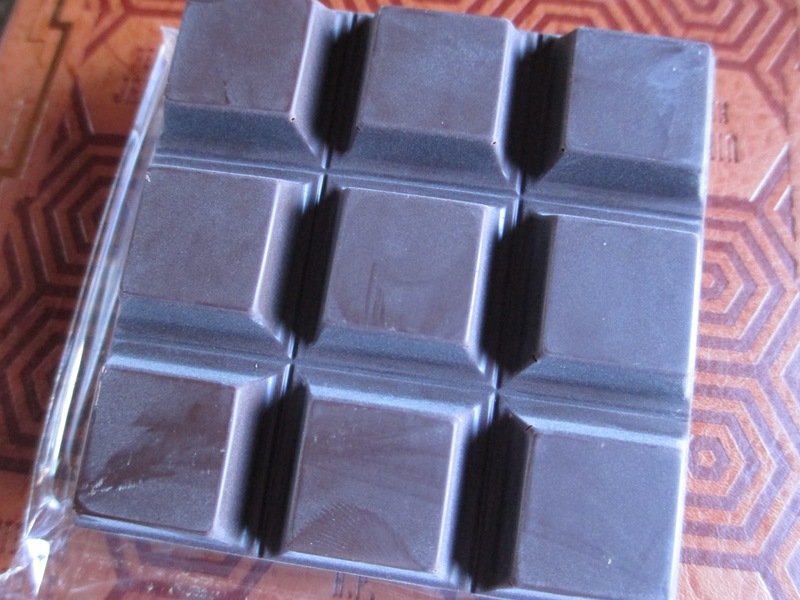 As with many novelty chocolates, this one is a blend of dark chocolate and milk chocolate. Generally this blend is a good idea: it keeps the chocolate from being either too sweet or too dark and gives the illusion of a slight complexity of flavor. So it is with this skeleton. Not at all dark but also not quite confection-sweet, either. Yet somehow you get the sense of a duality of flavors: the creaminess of the milk chocolate underneath the sweet-dark flavor of the dark chocolate. Whether or not you like this blend will be as subjective (or perhaps more) as usual. As for me, I find it still a little too sweet and yet flat in flavor and the texture a little too . . . fluid. I can nibble on this chocolate as a confection, but I don't like it overly much. If, however, you like Godiva's standard dark chocolates or like chocolate in a more general and less specific sense, I think you may quite like this chocolate. As far as the design goes, though, I love it. 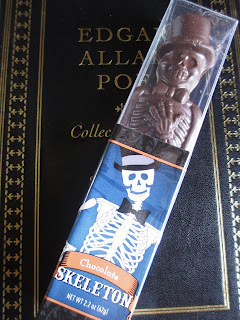 Look at how elegant that skeleton is with his cane and top hat. I do love characters with canes. Why do you suppose he has his hand at his chest? If he is the gallant gentleman, I suppose he is making a gesture of greeting, perhaps bowing slightly at the same time. Or maybe he's clutching at his chest because he ate too many chocolate candies in life and that's what caused his heart to fail and send him to his skeletal state? No, no, I say he's just being friendly. In fact, I wish there were a way that you could see more of the skeleton when he's in his packaging: he'd be great for putting around in Halloween displays. As is, I suppose you can get him out of the clear box on Halloween itself and set him around a dessert display. Or maybe a few of these lined up around a cake or something, as if they're about to dance a jig. (Hey, that's why his hand's out: he's dancing.) Whatever nonsense I said about how these skeletons were molded, they do nonetheless look great when they're up and out. Okay, now I'm getting a sense of what I like best and least in the Star Wars books--that'll help for eventually down the line when I'm ready to start reading some of the non-canon books and want to know which ones I might be interested in. Dark Disciple by Christie Golden has a lot of what I like--I really enjoyed reading it. As the line on the front cover, it's based on unproduced episodes of The Clone Wars, making me glad that I finally finished watching the show before starting this book. Now, when I finished the show, I had been expecting something more on Ventress, so the story that's told in this book is exactly what we needed. Ventress still had one more story to tell. Though, in fact, Ventress is only part of this novel; the other half is Vos. I know that he appeared in The Clone Wars, but I won't lie and pretend that I remember him from there. All the same, he become like a real person in my head. Ventress, too, I began to have more of a connection toward than I'd had while watching her in the animated series. And that's what worked so well in this book: it's character-driven. Well-developed characters that you want to hear more about and whose growth and trials become so important to you. You quickly see where part of the plot is going and after that you know that there are only a couple of options for how it ends (I mean, we all know that it's Anakin who kills Count Dooku), but none of that matters: the important things that you want to see unfold aren't exactly the basic plot elements--they're the subtle (or less subtle) progressions in character. And that is also what I love best in Star Wars in general. I like to watch Luke discover how, with simple actions, he can rid the galaxy of its tyrants. How Anakin lets a little fear turn into an enormous rage that he lets consume him--until his son is able to bring him back and remind him of the man he once was. 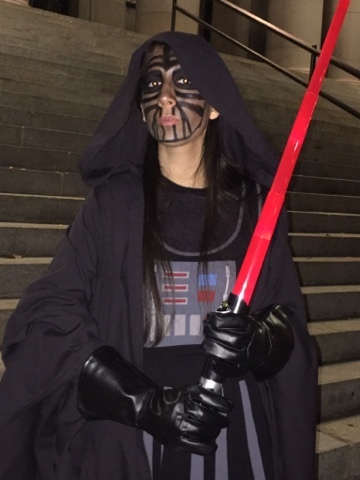 Dark Disciple has many of the character themes that we're already familiar with; in fact, the story is quite similar (though with key differences) to Anakin and Padme's. That doesn't mean that it feels repetitive; it just means that it feels familiar, like something I like from this universe. 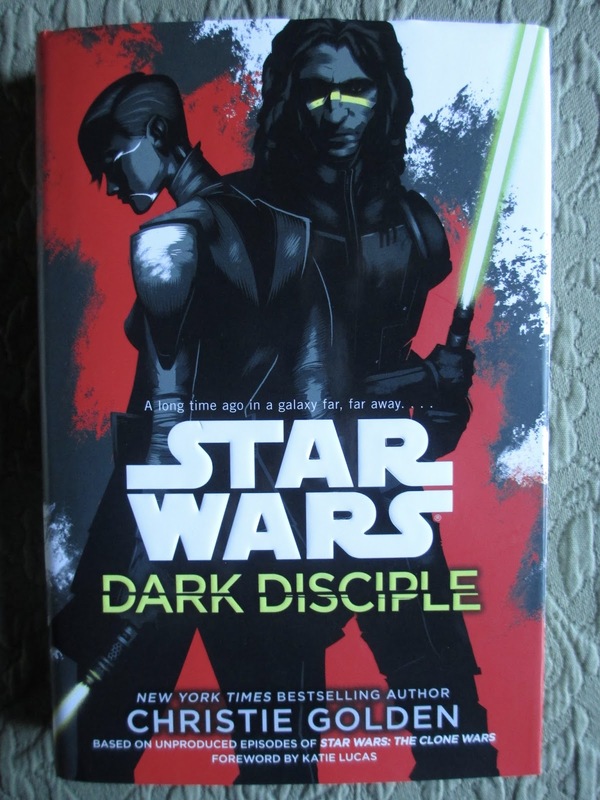 I love the twist in the title: since Ventress is the baddie, I'd assumed the dark disciple was her. In reality, though, the location of the darkness is more complicated--and Ventress isn't a disciple this time. The tone is very much in line with The Clone Wars. In the brief moments when Anakin or Obi-Wan showed up, I found myself hearing the voices of the actors from the animated series instead of from the movies (or maybe it's because I just spent so much time watching The Clone Wars). That dash of humor is in there, as is the familiarity with certain planets and peoples that don't really show up in the movies but do in the animated series. Oh, yes, and there is Ventress. Ah, Ventress, I didn't care much for her when she first turned up in the show but now I have such affection for her character. And Vos, too. I think they're both still alive inside my head: while I was reading, I would fall asleep thinking of the two of them and I think the tone of the book somehow colored my dreams. Their story, to me, goes down with the great Star Wars plots. Ah. Perhaps it is a good thing that I got two bars from Nibble Chocolate instead of just one: if I had chosen just one, it probably would have been this one instead of the other and yet I think that I like the other more than this one. (The other is, of course, their 77% Cocoa--you can read that review here.) You see, I often enjoy chocolate in the 80% range because when it's well done, it provides depth of flavor without too much sweetness. 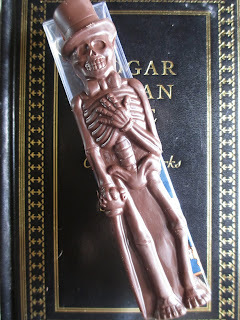 The first touch of this chocolate's flavor is bitter, deep and dry bitterness, too. Then you get some of the sting and the chocolate begins to melt in what I would find a tad too dusty of a manner. It mellows out a bit around halfway, becoming richer and more tender--and more pleasant. I agree with the soft fruity description; it isn't as zingy or citrusy as other chocolates. 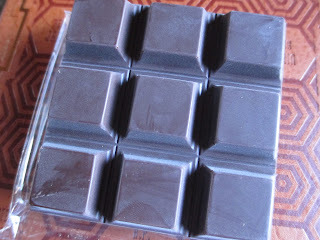 The finish is quite nice: as the chocolate melts, it becomes more and more mellow. If, of course, you have a second piece, the initial bitterness is much less. It doesn't sting so much and so you can move much more quickly into enjoying the rich chocolate flavor without the distraction of the dry bitterness. 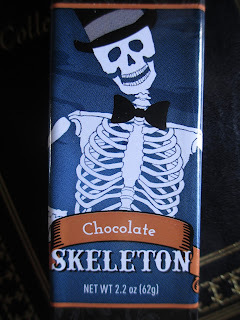 It's still quite dark chocolate, though, and not normally the type of 80% range chocolate I like best. There is nothing of sweetness in this chocolate, so just know your chocolate tastes before you choose this one and pick a lower percentage if you know you'll be happier with that choice. 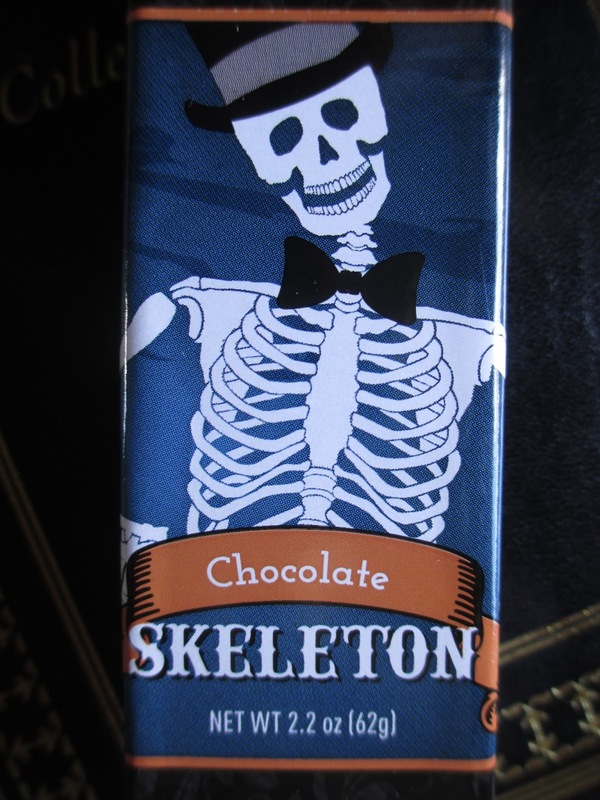 For myself, I'm a little torn on this chocolate bar. I didn't like it much at first, but it's growing on me. It's definitely better done than some of the other high percentage chocolates I've tried--but not as good as others. Granted, the chocolate bar I tried may have been starting to get old: besides the light bloom that you can see in the picture, the texture was also a little harder than it ought to have been, which may have been more a product of age than of initial quality. So maybe I didn't try it under ideal circumstances. Nibble Chocolate has something good going here. They obviously pay attention to the cocoa beans that they're using, making sure that good quality ingredients are leading to a good quality product. A few adjustments, though, would make them even better--smaller square sizes for one (I mean the nine squares that the bar breaks into, not the size of the bar itself). I would try more of their range, although I'd probably not choose this particular bar again; it just isn't quite my style. So. Lords of the Sith. 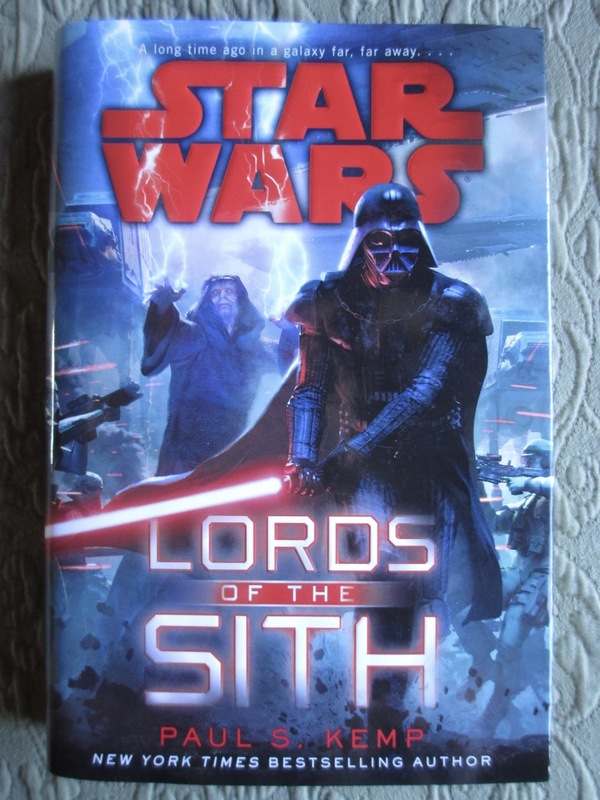 A book about Darth Vader and the Emperor that also has a great deal of focus on the rebel group on Ryloth (I am so glad I finished watching The Clone Wars before reading this book). The story of the rebels is interesting: they're well-developed characters that, as a reader, you want to see succeed. And yet there is also that theme in there of what is good and what is not good and why. Early on, Cham reminds himself that they are freedom fighters, not terrorists, and as you continue reading, you realize how much easier it would be for them to win if they were straight out terrorists--and yet if they won that way, their victory would not be worth the defeat of the Empire because they would be exactly the same thing as the Empire. It's similar to the problem the Jedi face when fighting the Clone Wars, trying to hold to their values while also trying to win a war, which is of its nature already against their values. So that's interesting. But I wanted to see a little more of Vader for a book that's called Lords of the Sith, not Ryloth Rebels. I wanted to see more because the scenes with Vader and the Emperor were really good. Sometimes I wonder what was going on in Vader's head for those twenty some years before Luke convinced him to abandon the dark side. Does he ever think of his life before? How does he justify all the things he does? How is it that he turns away from the dark in the end but never before that final moment in his life? How did he stay under the Emperor's rule for so long? Those questions are what the Vader passages in this book are about. You get to see a little more of how Vader and the Emperor interact and why Vader obeys him. What I wasn't exactly expecting was the implication that Vader will one day try to defeat the Emperor--because that's what all Sith apprentices do. Here's why that interests me: it's one inevitable action that is expected to be done in one way (so that Vader can take the Emperor's place) but ends up being done in another way (Vader defeats the Emperor simply to take him out of power, even while knowing that doing so will be his end, too, and not caring because it is his chance to make amends for all the terrible things that he has done alongside the Emperor). So all the character moments, where Vader gets faint reminders of his past, or where there were references to what will become future events were what made this book good. It's also an action book. A lot of shooting, in space and on land, between ships and people and animals. (I've realized, by the way, that I vastly prefer the scenes that take place on land versus in space--maybe that's also why I had less interest in A New Dawn and Tarkin since they had a lot of space time. This one was maybe half and half?). So if you like all the excitement, there you go. For me, I found this kind of a sad book to move through: it shows how much the rebellion had to go through not to defeat the Empire but just to try and hold out against it. You don't want to see them defeated but it is a book about Vader so you know Vader has to win in the end--and you sort of want to see how he does it (because, you know, Vader's cool even if he is evil), but you regret that he has to win. Ah, the tragedy of Vader didn't affect only his family--it affected the whole galaxy. I'm thinking this will be a new series in which I explore my concepts of upcoming holidays--that is, holidays that I in some form celebrate. If I don't celebrate them, then I have nothing to say about them; so if you want a certain holiday to be talked about, you be the one to talk about it. As time goes by, I realize more and more that everyone sees something different in holidays--so this series is about what I see in them. Sometimes the question of what a holiday is about is simple and sometimes it is more complicated. I think Halloween is one of the more complicated ones, maybe even more complicated than Christmas, though Christmas is generally the one people have differing attitudes toward while also realizing that they have differing attitudes towards it. Halloween is one of those holidays that some people have trouble with. Is it a day about embracing the Dark Side, about inviting in the monsters and the ghosts and the demons in a real sense? Or is it just an innocent day of fantasy? I'm not really quite sure. Most people seem to take it as a time to get scared, in the same way that they might watch horror movies just for the fun of it. You dress up and eat candy just for the fun of it. Just for the fun of it is the phrase, and I think there is usually no more depth to the holiday than that. But I still feel like there is an edge I don't like to veer off of with Halloween. I'm not the type that likes watching horror movies: I don't like it when they scare me and if they don't scare me, there isn't really a point to them. So I obviously stay away from the Haunted Houses and things. And I'm fine with putting out skulls and skeletons because what's wrong with skulls and skeletons? They're just bones and everyone has bones. But I don't like all the gore (I suppose I'm just not a gore person) and I'd rather stay away from the demons and ghouls (like, why would I want to put around or dress as a roach or lice? demons are the same thing to me). Spiders are okay because they're just animals to me--as long as they're not very gross-looking, I'm not really scared of spiders (there are always so many in and around where I live that, well, I have to be used to them). Let's see. 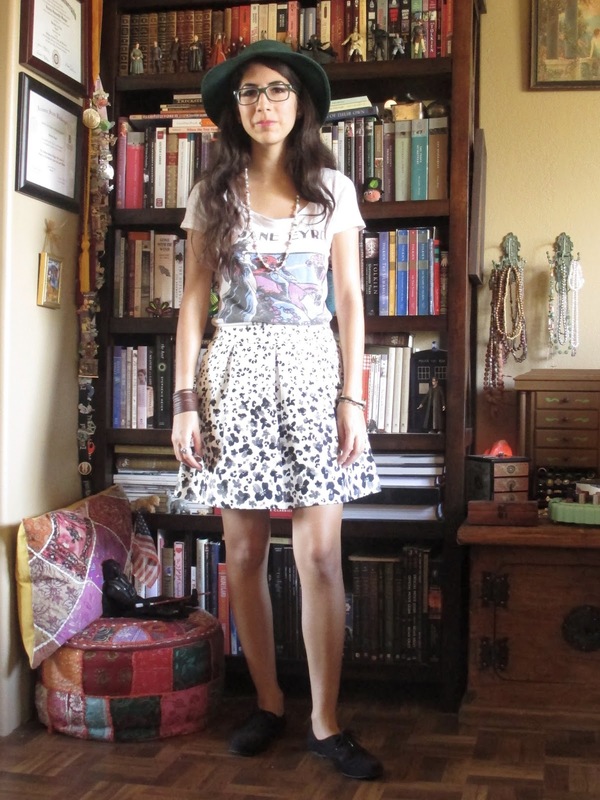 I brought up the dressing up thing. So that should bring me to what I do celebrate with Halloween if not terror, horror, and darkness. 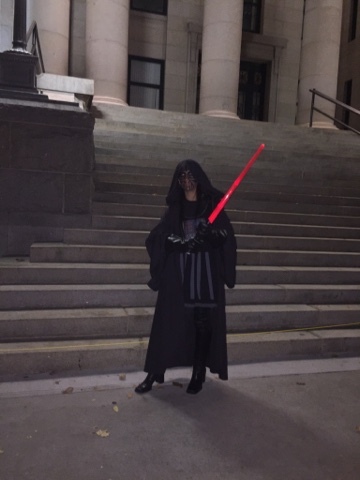 I like the chance to dress up, even if it's just wearing my Darth Vader dress from Her Universe. Villains are fine to dress up as; again, I'm just not into the gory or, let's say, frightfully evil costumes. And this year I am seriously considering posing as a twelve year old and going trick or treating (I'm short, so this could work more easily than I'd really like to admit). We all know I love the candy. Then I like to decorate, with Fall things like pumpkins and with black, white, and silver things like skulls, skeletons, vultures, and maybe spiders. Once the weather starts to cool off and the days start getting dark so early, I feel like I need to start decorating for something. So Halloween has kind of turned into my transitional holiday: it's the transition into Fall and the transition into decorating, starting with light and barely visible additions in neutral colors (no orange for me). And I guess that's about it. Nice and simple and straightforward; that's how my Halloween is. What's yours? One question: why didn't anyone tell me I had to watch The Clone Wars? I guess I heard about it more a couple years ago when the sixth and final season was released exclusively on Netflix, so they were advertising it quite a bit on there. But I thought, oh, an animated series, I probably don't really need to or want to watch that. How can it really be that great? But then when I decided that I was a Star Wars fan and should therefore act like one, one of the things that I decided went under "acting like one" was to watch even an animated series from this universe. I remember it was last October that I watched the movie that served as a pilot to The Clone Wars; I didn't consider it that great, as I'd expected. But I was determined to keep watching. I watched the first season rather slowly, it would seem: I hadn't realized it took me nearly a whole year to watch the whole show. As you move through the first couple of seasons, you begin to realize that there are some good episodes or good moments scattered among the more mediocre content. Sometimes it is "just an animated series" and sometimes it's pretty good. And then by the time you're making you're way well through Season 2, you begin to realize that those good episodes are well worth it. Stellar, absolutely stellar are some of the moments in this show. All the depth of theme that's in the movies, all the drama and tragedy, all the analysis of human behavior and decision-making and resolve. I got used to the formula that also exists in many other TV shows: you'll get a really good episode or set of episodes and then a bad or mediocre episode or set. The mediocre episodes could have good moments, too, but they were slower for me to move through. And, oh, the end of Season 5, as I've mentioned, was just . . . touching. Definitely not something I would have wanted to miss. So if you're like me and you say you like Star Wars but haven't watched The Clone Wars yet, do watch it. Now on to specifics (with some possible spoilers toward the end if, you know, you haven't watched but want to watch). What sometimes made it difficult to keep up with the show was its scattered nature. It sets out as if the focus is on Anakin and Obi-Wan, but it isn't really. Some episodes they only appear briefly in and some they aren't in at all. Some episodes focus on the Clones, some on the droids, some on other characters (both minor and less minor). It's a big set of characters, which helps to establish this universe as a real place but also makes it a little difficult to want to follow along with everyone when you have your favorite characters that you'd rather hear about instead. There were some good characters introduced in the series, though. Satine was an interesting character, as was her place within the show: basically she is there to provide a way to compare Obi-Wan's reactions to certain events with Anakin's reactions to the same type of events (but centered on a different person, of course). Cad Bane kind of scares me, and I'm not sure if that's in a good way. Hondo kind of grew on me, though (by the way, I hate auto correct and apologize if I don't catch any of its "corrections" of names that I spelled right when I typed them out). Ventress grew to be pretty . . . interesting. Ah, yes, and then there is Ahsoka. If you ask me, I say The Clone Wars is all about Ahsoka. Her energy, devotion, and kindness make her the type of character you like from the start. Seeing that T-shirt saying "Ahsoka Lives" and seeing her brief appearances in Rebels, I thought that it would appear that she died at the end of the series. I was sure that would happen. So I was surprised (and even kind of frightened, I guess) by how events unfolded: that was tragic. And then that final bit of her walking away, oh, so beautiful and, oh, so sad. I was almost crying. Seeing Ahsoka so put down--because the ones she had put her trust in (her entire life) hadn't trusted her back. So that was wonderfully done. I was just disappointed that there wasn't something more in Season 6 because I was kind of expecting something else and I wanted to see more of her character. But I guess that's why she's in Rebels now. I've hardly covered any ground and yet I've already talked too much for one post. So I'll leave it at that. A lot of what I considered fluff in this series and also a lot of wonderful moments that were well worth watching. New characters, familiar characters, a bit of action, some mystery, some philosophical pondering, and also just a longer look at more of the people and places that inhabit this universe I once might have thought I knew so well. Can we please forward two more weeks until Season 3 of Rebels starts airing again so I can get more of my Star Wars animated series fix? Most of the things on here this month are either birthday gifts or purchased with birthday money. 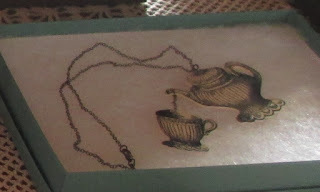 1) Teapot Necklace - Originally from The Huntington Library store, this necklace is thin and flat, like a little drawing. 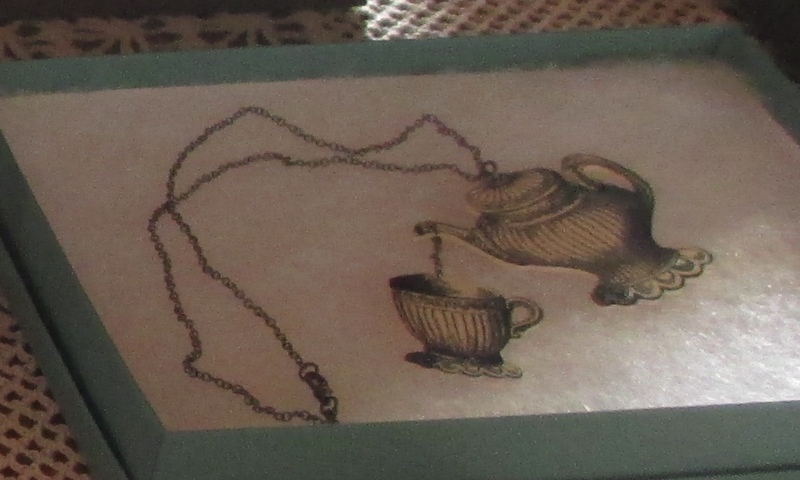 Somehow I feel like I need to wear it with a blue dress--perhaps for Alice in Wonderland reasons. I do like a nice cup of tea at all the best parts of the day. 2) Star Wars Figures - There was an antique market going on and what should I end up with but a baker's dozen of action figures and one lizard pin (I'll put that one in next month's favorites if I remember). They were for less than the average price, so I figured I would get a few to start my collection. They've set up camp on my bookshelf. 3) Makeup Eraser - I don't know if you saw this advertised in a Sephora email, but I thought the concept was worth looking into. This is a fairly big piece of pink cloth that's supposed to take off even waterproof mascara. 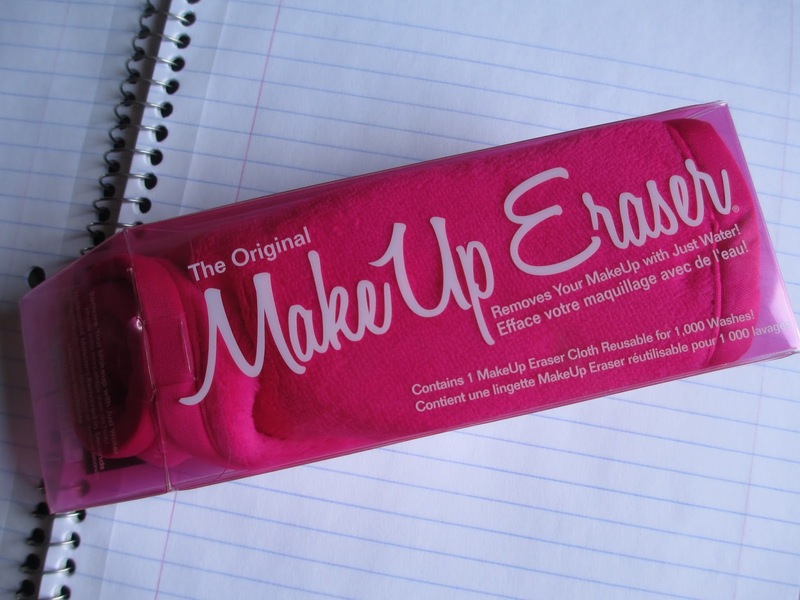 You just wet a corner of it and rub your makeup off. And guess what? It really is that easy (the waterproof mascara didn't come off too easily for me, but that could be because I don't use hot water like the instructions say since the water where I live takes a while to heat--but other makeup comes off great). No need to buy makeup remover (I used to use almond oil) and no need to be throwing away cotton rounds every day; it's less waste. You use a new corner of the cloth each day and then wash it once you've used every corner. 4) Darth Vader Notebook and Notepads - Um, I don't think any commentary is necessary here. Star Wars plus stationery means I'm in. For the notepad, the middle one is actually Boba Fett and the bottom one is a Stormtrooper, not Darth Vader. 5) Zoya Nail Polish Topcoat - I needed a new clear coat and since I had been pretty happy with one of Zoya's colors, I decided to try their topcoat, which is quite good and shiny. You can buy it at Ulta. 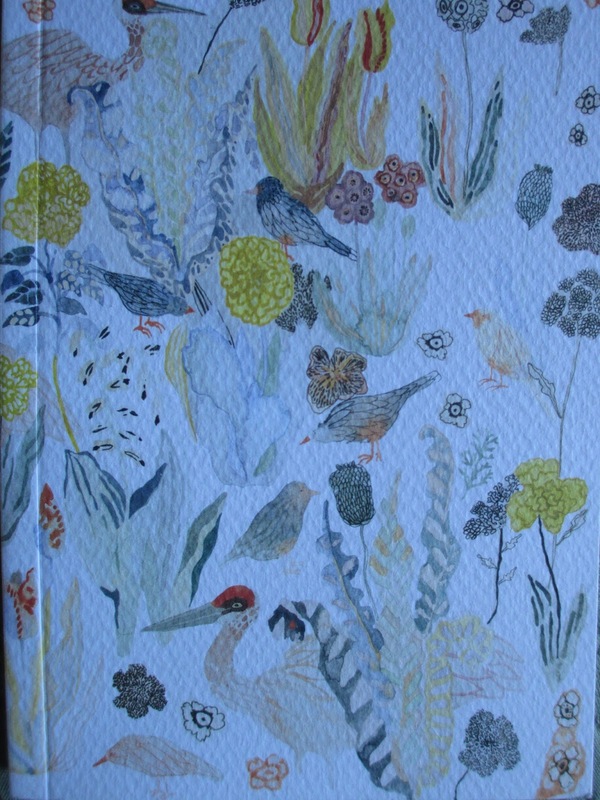 6) Anthropologie Notebook - Pretty, sort of tropical artwork drew my eye in to this little notebook; I think I buy more notebooks at Anthropologie than clothing. 7) Anthro Shirtdress - Well, I guess I do buy some clothing there. I had to choose something for my birthday (I make that sound like it's a bad thing) and I was just seeing Star Wars when I looked at this shirt. It reminds me of Luke's Tatooine outfit from A New Hope. So here I am trying to channel Luke Skywalker, in green and brown instead of white. 8) Sephora Tarte Set - I had been waiting for Sephora to have a Tarte set for their rewards program. This one has a lash primer, lash fibers (which I always thought sounded weird and haven't tried yet), a mascara (this is why I hardly ever buy full sized mascaras anymore), an eyeliner, and a lip color in a happy red color (perfect for the coming cooler weather). 9) Sephora Birthday Set - And then they had their birthday set from Nars this year. 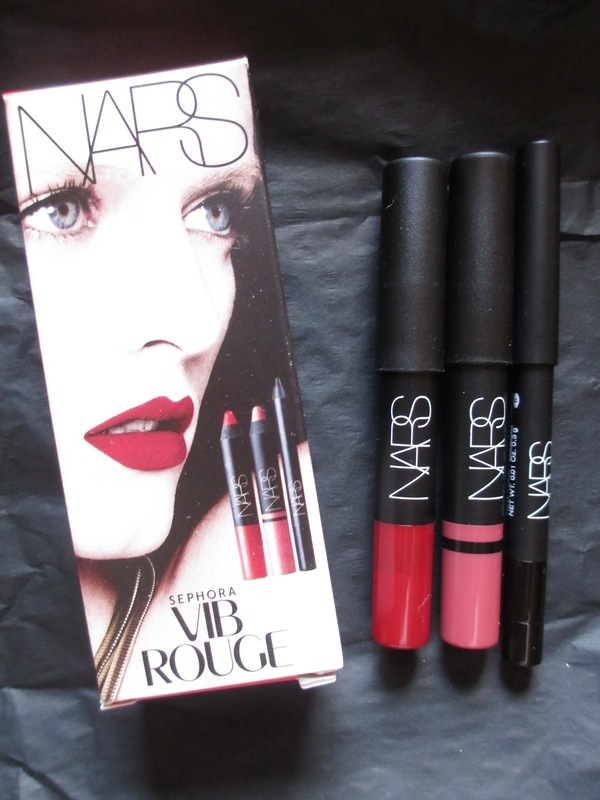 I've heard that their lip colors are so wonderful, so I've been looking forward to getting these two all year. I know I try and stick to more natural makeup (especially for lips), but I'm willing to make the exception here. 10) Stereoscope - Have you ever seen one of these? 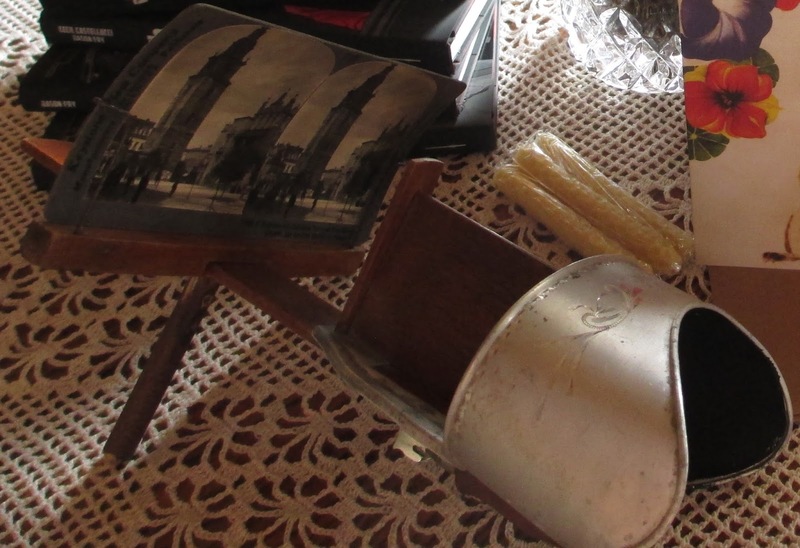 They're Victorian 3D tech. You slip one of the picture boards on the end; these have two of the same picture on them. And then you look through the eyepieces and adjust the distance of the picture as needed for it to come into focus. And then the picture suddenly has depth to it. It's really pretty cool. Mine also came with a stack of pictures.